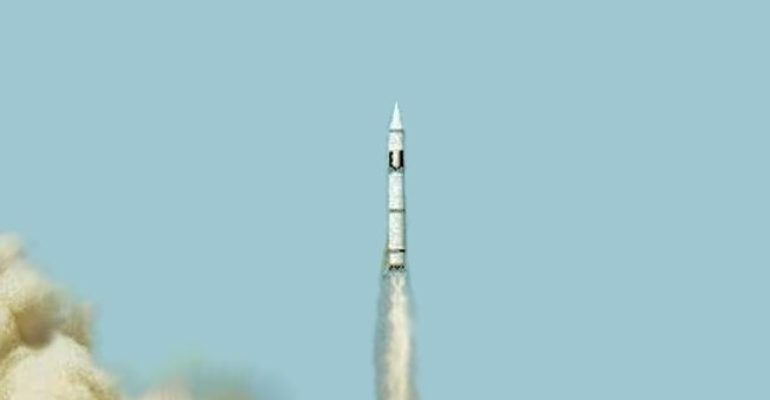 The Dong Feng-5, or DF-5, is China’s first Intercontinental Ballistic Missile to exceed 10,000km and was showcased during a military parade in 1983. Fitted with a single warhead, the original ICBM variant has a length of 32.6m, a diameter of 3.35m, and weighs 183,000 kilograms. Being that the DF-5 requires between 30-60 minutes to fuel, it is due to be replaced by the DF-41, however its more recent MIRV capable variants, the DF-5A, DF-5B, and DF-5C have considerably expanded the DF-5 model in areas such as accuracy and range. It is still unclear precisely how the DF-5 is stored and how many are in operation due to decoy silos and uncertainty within the U.S. intelligence community. However, current estimates range from 10 to 20 deployed DF-5 ICBMs. The DF-5A has been operational since 2010 and is a MIRV-capable variant of the original DF-5. It is the first DF-5 model to be equipped with multiple independently-targetable re-entry vehicles and is fitted with 1-3 MT yield nuclear warheads and decoys or penetration aids to increase the chances of surpassing missile defense systems. The DF-5A and the DF-5B are presently in production by the People’s Republic of China and are both considered to be operational by the U.S. military. Revealed in Beijing on September, 2015 the DF-5B is China’s most recent DF-5 variant and is much larger than its counterparts. Carrying up to 4-8 nuclear warheads with a circular error probability of 300-500meters, the DF-5B represents a major threat to U.S. missile defense systems. As of 2016, China is suspected to possess nearly 10 DF-5B launchers and 30 warheads. In early 2017, China purportedly tested the DF-5C, which is capable of carrying 10 nuclear warheads. The test marked a significant advance in China’s strategic nuclear deterrent. These developments can aid China to maintain a retaliatory, counter-value-oriented WMD capability, as well as prevent potential WMD-based blackmail and intimidation by other powers. For many, possession of such abilities also grants China the respect and status of a major power. The primary targets for the DF-5 ICBMs are locations in the Continental United States territory. In the first half of the 2010s China upgraded 10 DF-5 missiles to the DF-5A variant equipped with three nuclear warheads. Beijing is concerned that a U.S. attack could destroy much of its ICBM forces, allowing the U.S. to depend on its missile defenses to defend against the diminished Chinese retaliatory response. Over the last decade, it seems that China has attempted to address this strategic problem by increasing the quantity of its nuclear warheads and MIRVing its silo-based DF-5 ICBMs. The alterations made to the DF-5 can also act as a geostrategic defense made against other nuclear powers such as Russia and India. China has also begun strengthening its sea-based nuclear force capability, according to the Department of Defense.